Warner Bros. Pictures held a test screening for Harry Potter and the Deathly Hallows – Part 1 today in Chicago, Illinois and scooper ‘Kyle’ was in attendance. You can read his thoughts below! I was lucky enough to get invited to a secret test screening of Harry Potter and the Deathly Hallows: Part I at the AMC River East in Chicago this afternoon. We weren’t told what movie we would be seeing until seconds before it started, but my friends and I suspected that it may be Harry Potter due to the Warner Bros signs and the intense security. When producer David Heyman walked in, I was pretty sure what it would be. Director David Yates was also in attendance, and spent some time talking with fans outside the theatre after the film. Harry Potter and the Deathly Hallows: Part I is a great continuation of the series, thematically and visually in line with films 5 and 6. Though it is a fast-paced film, with several nice setpieces and much-improved performances from the young cast, it does suffer from two major problems. First, it faithfully adapts the seventh book, including the book’s own problems. The “camping in the wilderness” scenes become quite repetitive, and the attempts at drama/angst amongst the trio during these scenes comes off as tired. Also, the scenes involving the locket horcrux causing its wearer to be angry/aggressive are far too reminiscent of Lord of the Rings. All three young stars acquit themselves admirably, however, doing the best they can with the material. Emma Watson and Daniel Radcliffe, in particular, are quite good. The second problem with the film, and this may be fixed by the time the final cut is released, is the editing. Some scenes feel utterly rushed and incoherent (Godric’s Hollow, for example). Others go on for far too long (Ron becomes jealous, etc.). There are several flashes / dream sequences that demonstrate Voldemort’s search for the Elder Wand. These are bizarrely edited and poorly executed. Luckily, they are just a small fraction of the film. Despite these issues, this was a quality film on par with films 5 and 6, both of which I quite enjoyed. As with those films, the cinematography is beautiful. There are several creative and dramatic shots throughout the film, so that even if one gets bored, you could just stare in awe at the scenery. The beginning of the film is also quite exciting, including some hilarious scenes with multiple “Harry”s, and a series of great action sequences. The visual effects were not completely finished in these sequences, but I imagine it was quite close to what the final version will be. Another effective sequence involves the trio escaping to a small cafe in London, and a resulting fight that involves wands and spells but feels more like a shootout. The film ends at a very appropriate spot, and though not exactly a “cliffhanger”, left me greatly anticipating Part II. At the end of the film, we all filled out lengthy questionnaires regarding our opinion of the film overall (I gave it 4/5), as well as our likes/dislikes with the performances, scenes, and other aspects. Though I will reserve final judgement until after seeing Part II, this is overall an effective and exciting, if not perfect, continuation of the series that struggles with some of the same problems as the final book, but mostly overcomes them through excellent technical aspects and performances. 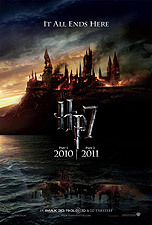 Harry Potter and the Deathly Hallows – Part 1 hits 3D, 2D and IMAX 3D theaters on November 19, 2010.